Over the years I’ve become aware that preparing a dish with lentils is a traditional Italian New Years dish, said to bring good fortune in the year. We look at it as a great way to celebrate the new year, and what better way to usher in the new year but with a bowl of comforting Lentil Soup? My grandmother (Nonna) made it throughout the year but I remember it most during the fall and winter months. Lentil Soup is one of our favorite soups, it also happens to be extremely healthy and easy to make. Our take is made with a basic soup soffritto (garlic, onions. carrots and celery) and chicken stock. Chicken stock might be typically used but it also be made with other stocks such as vegetable or even beef, we do prefer chicken. 1. Sauté onions, garlic and pepper flakes in olive oil until the onions begin become translucent and the garlic begins to show browning. 2. Add the celery and carrots, mix well and let cook for 5-10 minutes before adding the diced tomatoes. 5. 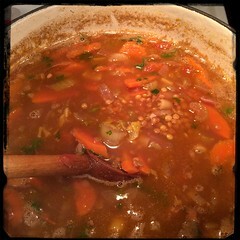 As the soup base simmers for 5-10 minutes, and the lentils have cooked for at least 5 minutes a cup of water, let come to a boil. 6. Add the cup of wine and let come to a boil. 8. You should add bay leaves at this point but you can add them at any stage when adding liquid. 9. Add the remaining 3 cups of stock, one cup at a time allowing the soup to come to a boil ech time before adding more liquid. 11. Add the lemon juice, salt and pepper (to taste) and let simmer for at least 20-30 minutes before serving. 13. Once the pasta is cooked, serve with grated Romano cheese on top (optional).